Claudy Rovers striker James Boyd could be their match winner in the League Cup Final. Ardmore and Claudy Rovers have the chance of claiming the first piece of silverware in the North West Junior season. The pair face each other next Monday in the final of the League Cup, at Wilton Park (KO 1.30pm). Three points seperate the sides in the Premier Division, so neither side go into the final as favourites. Only a few weeks ago the teams played out an entertaining 3-3 draw and although Rovers secured a victory in their first meeting this season, Ardmore boss Damien McGee believes there isn’t much between the sides. “To be honest if both sides are able to field their strongest teams then it’s a toss up,” he stated. “Both teams were missing players in the last game, so you didn’t really get a true reflection that day. “Look like any cup final and with both sides being evenly matched, it’s going to be a case of who turns up on the day. As for Rovers boss Ryan McDaid he agrees with his opposite number and feels it’s too close to call, with maybe a bit of luck deciding the final. 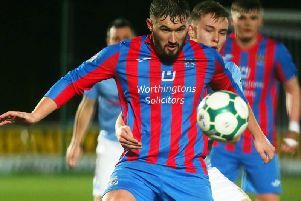 “Thankfully all my players will be available, in fact I’ll probably have a selection headache as a number of boys are back from university and the gaelic season is over, but to be honest there isn’t much between the sides,” McDaid admitted. “We have had two tough games against Ardmore already this season, so I’m expecting another tough one next Monday.